In a saucepan over medium heat, add in about ½ pound of hot sausage. I used 3 links and removed the casings. Break the meat apart as it browns. When the meat is fully cooked, drain off any fat. Add in the roasted garlic sauce and let simmer for about 10 minutes. Stirring occasionally. While the meat sauce is simmering, add the ricotta, shredded mozzarella, and parmesan cheeses together in a medium mixing bowl. Add in the dried parsley and garlic powder. Mix the cheeses, parsley, and garlic together until incorporated. Spread the cheese mixture into the bottom of a 8x8 dish. Add the meat sauce on top of the cheese. Add the thin slices of mozzarella on top of the meat sauce. Place into the preheated oven and bake for 27 - 30 minutes until bubbling. Serve hot with bread or chips. 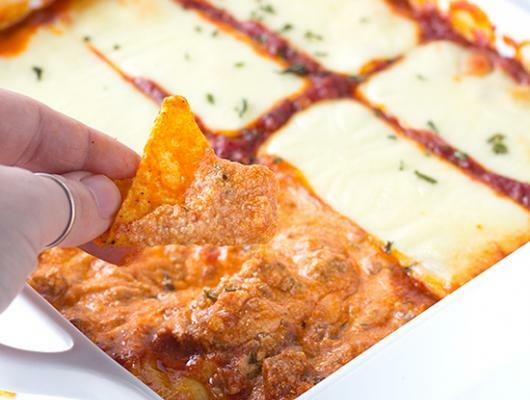 Lasagna Dip - Loaded with ricotta, mozzarella, and parmesan cheeses as well as hot sausage and Ragu sauce! 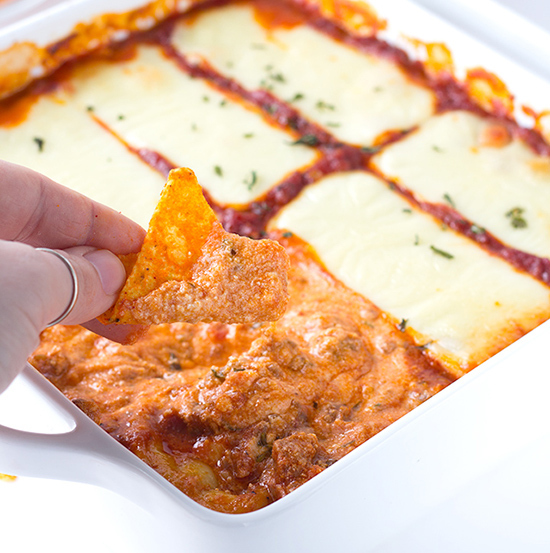 This cheesy dip is amazing piled on bread or chips!